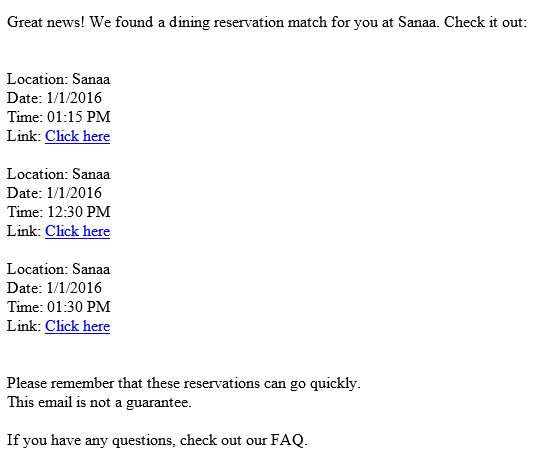 Recently, articles have been written about a service that essentially scalps Disney Dining reservations. We share in the warranted outrage about a service like this along with many, many guests and Disney fans alike. We wanted to take a moment to talk about how we’re different, what our service does, and what it doesn’t do. First off, we don’t make reservations, we don’t scalp reservations, and most importantly we don’t sell reservations. We never have and we never will. We think that hoarding reservations to resell to guests is wrong. It creates an artificial demand for seats that are already in extremely high demand. Scalping makes it tougher for everyone to get into these restaurants, not just last minute guests. So what does our service do? We simply keep an eye out for reservations and send a notification to our members if a table opens up. Contained in every notification we send is a link to the Disney Dining site. It is then completely up to the member to either click on that link or call Disney Dining to secure the reservation. As a matter of fact, outside of feedback from our members, we have no idea if our members are successful in booking their reservation. This is because the entire transaction is out of our hands and occurs on the Disney Dining site. Our service is best described as a time saving service. We search constantly, so you don’t have to and then notify you when we find an open table. 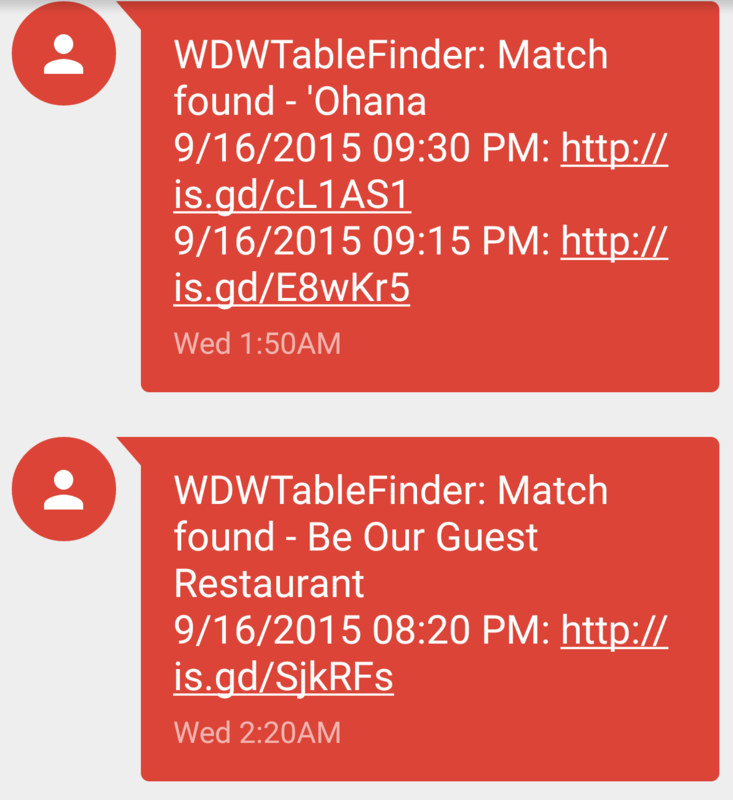 WDW Table Finder is a result of my passion for Disney and my passion for technology. What was originally a weekend project, has turned into a big chunk of my time. I love helping other guests get into their favorite restaurants, and I want to thank everyone who has ever sent me an email or posted on our social pages letting me know that they had success with the service. It’s unbelievable to me to think that something I’ve created has helped so many other guests and families make the most of their vacation at Walt Disney World. I also want to thank Shannon at WDW Prep School. She recently talked about our service and how it differs with scalping services in her WDW Prep School Podcast. She has always been more than kind to me and WDW Table Finder from the beginning. We’re currently working on some cool new things for the site and can’t wait to show them off! Additionally, if you have any questions or comments about our service, please reach out to us through the comments section, social media, or email. We’d love to hear from you!